ChicagoCon: "Hacking the Web 2.0"
Hey everyone - if you're in the midwest and have some spare time the week of May 8th and 9th (Fri/Sat) why aren't you coming to ChicagoCon? The conference will feature people like my good pal Mike Murray, and even I'll be there giving a Saturday morning workshop entitled "Hacking the Web 2.0", a hands-on way to learn some of the basics of "auditing and testing" Web 2.0 appliations with a focus on AJAX and Flash-based technologies. Come on down. Bring your friends, co-workers, or your boss. I promise you'll learn something and have a darn good time. Also... I've got a super-secret surprise if you haven't registered yet... post a comment that you're going but not registered yet and a way to contact you. Early birds get the worms. Priviliged context | According to Adobe's reference, once you explicitly state your trust for a document's signing certificate, that PDF file can then do "priviliged things" which otherwise would be disallowed. Seriously, how hard is it to fool even an educated user to trust a digital certificate? Rubbing salt in the wounds of over 1MM people who had their personal information compromised, the IRS (Internal Revenue Service) has awarded RBS WorldPay a contract to process tax return payments for the 2010 filing season. The Internal Revenue Service has awarded a contract to process tax return payments for the coming filing season to RBS Worldpay, a company that recently disclosed that a hacker break-in jeopardized financial data on 1.5 million payroll card holders and at least 1.1 million Social Security numbers. It would seem to me that this is rubbing salt in our wounds. The article goes on to show how even the government is resting on the laurels of PCI Compliance, in an effort to comprehend (or at least pretend to comprehend) the complexities behind securing private information in the banking/card services sector. IRS spokesman Anthony Burke said RBS will not be allowed to process credit card payments for taxpayers owing money to Uncle Sam until Jan. 20, 2010. Before that date, he said, RBS will not only have to show that it is once again PCI compliant, but that it also has passed the IRS's own payment security audit. All I can really say is... yikes. So are we once again equating passing a "point in time" audit as demonstration of overall good ongoing security? I know this could spark a disagreement between the two sides in the compliance-based security debate, so I'm going to leave that alone for now. My bigger concern is that the US Government (the same government which has now spent our great-great-grand-children's money) is making some very poor decisions. There is also a hint of using the IRS's "own payment security audit"... but a browse and search through the IRS.gov website, including their FOIA (Freedom of Information Act) reading room, shows zero documents or disclosures relating to this audit process... In a government which is re-inventing itself as more transparent... this type of information would be nice to have. This quote caught my attention immediately, as it hints at a 3rd party "verifier" of security; running a "series of tests" which I can only guess is a functional testing cycle rather than a security "vulnerability test"? "All service providers must undergo system acceptability testing," Burke said. "We have a third-party who runs a series of tests on all of our providers to make sure their systems are security before they accept credit card payments" on behalf of taxpayers, he said. On the heels of my OWASP talk regarding decompiling and analyzing Flash [see SWFScan link] files lots of you have asked "So what about Flash file encryption or obfuscation? Does that make my code any more secure?" I've done the research and talked to experts (including our very own Billy Hoffman) - and have a blog post just for those of you starving for this information. There are a lot of Flash file obfuscators/encryptors out there... all of them hoping to raise the bar for attackers against your client-side Flash code. I'd like to make sure I properly set the background for you here - everything you'll read about is happening on the client side within the user's browser framework, meaning, it's running in potentially hostile territory. User hits page, downloads embedded "blob"
Decryption|De-obfuscation routine runs, produces valid (unprotected) Flash! Immediately, in the above step-by-step you'll notice that step 5 the decryption|de-obfuscation routine has to run on the client to unprotect the SWF file. This essentially breaks down to mean that the deobfuscation|decryption code has to exist on the client, within the protected SWF file. Ask yourself what sort of security that buys you, if you're including the unprotect routine with the protected code. After wading through many different SWF encryption|obfuscation tools I've come to realize that they're selling to folks who simply don't understand the full scope of the problem. Here is an interesting quote from one vendor's marketing material. I'm not identifying the vendor... mostly to protect them from the questions you would have about their effectiveness. When all is said and done, to quote Billy Hoffman "It's like boxing a 7 year-old... you're going to win it's just a matter of how hard do you want to try". --Thanks to Billy Hoffman of HP's Web Security Research Group for his contribution to this blog, and his ongoing effort to protect developers from their own worst enemy... themselves. Over the years we've all seen the arguments over which operating system is "better" or for the purposes of this blog, more secure. In the end, I've always contended that any OS can be mis-configured equally poorly and each of the relevant, modern operating platforms has their positives and negatives. Whereas Microsoft's Windows platform tends to cater to the less technically intensive administrators, Linux covers those who need ultimate flexibility and aren't afraid to write their own code when the need comes, and the various UNIX platforms cater to more advanced administrators who don't need the GUI to control their OS. Those are given, accepted arguments that don't need to be re-defined. At the desktop, the debate of late has been which OS is more secure in spite of the user sitting at the controls. While Apple has launched an entire campaign aimed at making Microsoft's Vista OS look inept, insecure, and crash-prone... and quite frankly "no fun" they have quietly misled the audience. Apple's message, snuck into the latter series of the commercials, has been "Macs don't get viruses or malware"... yet they continue to advise their users to purchase and use anti-virus applications. Yes. While no computer connected to the Internet is 100 percent immune to viruses and spyware, the Mac is built on a solid UNIX foundation and designed with security in mind. The Mac web browser, Safari, alerts you whenever you’re downloading an application — even if it’s disguised as a picture or movie file. And Apple continually makes free security updates available for Mac owners. You can even have them download automatically. Fairly interesting, there is no mention of needing anti-malware software anywhere... Even more interesting is this link from SC Magazine which takes note of the quiet release from Apple telling users to start using Anti-Malware software on their Macs... even more interesting is the fact that the alert issued apparently doesn't exist anymore (it was pulled, or changed, or....?). Now it looks like there is even a new trojan hidden inside some Mac software (warez) downloads from the pirate Internet which creates a Mac botnet! While reports of how effective this botnet and trojan really was has been debated - quite frankly it's immaterial. The fact is, Macs are now a taret too. The Macintosh has become a victim of its own success, much like the PC was years and years ago. Apple's brilliant marketing blitz coupled with users' backlash against Windows operating-systems issues has propelled Macs to the height of popularity - of course this means new Mac owners and thus more Macs out there to exploit and use. Hackers are opportunists, I hope that's no revalation. The goal of a hacker is to exploit a system to achieve some end, usually that end is to make money. If I'm a writer of malicious code (or other malware) I want to tough the largest audience possible with my piece of software - therefore I will go after the largest market-share of operating systems. This clear example illustrates why Windows users have been the taret for such an overwhelmingly large percentage of malware over the years... simple economics. Now that Macs have become more popular we're starting to see an huge influx of clueless Mac users, much like the PC experienced years and years ago. Naturally, this means that more malicious software will start to flood the dark corners of the Internet as user volumes increase for the Mac. Stay vigilant... it doesn't matter what OS you're using, what browser you're using and how natively secure you were told your operating system is... you're going to be a target at some point. There is no such thing as effortlessly secure, the fact is that whether you're using a Mac, a Windows OS, or something else - you're still going to be a victim if you're ignorant. Fan of Ubuntu Linux? Thinking security? Linux Magazine has an article titled "Your Distr ois Insecure: Ubuntu"... and it hit home for me since I converted over from gentoo a few years ago and never looked back. It's a worthy read and bashes Ubuntu creators a bit for focusing too much on simplicity versus security - but can you blame them? This is a very careful high-wire act trying to keep usability high and making the OS simple to install, configure and use and the need to make it secure. My personal verdict? I still prefer it to a Windows box any day of the week for my needs; it's just important to continue to think about security even as you install Linux. An article on the Joong Ang Daily site today had a lesson for Koreans that the whole world can share in: Don't re-use the same login/password everywhere on the 'net. "Two computer programmers were indicted yesterday on charges of hacking into Web sites and obtaining personal data of 2.3 million persons and using part of that information to post spam advertisements on Naver and other Web sites." What made me cringe was this metric below... this is a full 6.5% password-re-use on this single site! "Of the 2.3 million people whose personal information was hacked, some 150,000 had used the same ID and passwords on Naver, prosecutors said. " Your anti-virus client on your computer is much like a CD player these days. It was cool, at first. Everyone got one. They were "cool" for a while. Now your car comes with it and you can't figure out where to plug in your iPod. I know there have been many, many blogs and articles that have said this, and even I have over the past year or so banged this drum too - but AntiVirus is simply a relic technology. Want proof? Go read the Verizon 2009 Data Breach Investigations Report (summary here). One of the things that immediately stands out to me is that a staggering percentage of cases (38% of the total investigated) were "hacked" by malicious software (malware). That's a mind-boggling number. Couple this with the fact that both SRA International, as well as Heartland Payment Systems were "hacked" by what was referred to as "malicious software strategically placed on their systems"... and you have a very, very serious problem brewing. The issue is exacerbated by the fact that corporate security still sees "antivirus" as a reasonable stop-gap for combating these types of threats. I can't tell you how many people simply nod their head and smile when they hear me rant about how I hate the agents that continually get added to my corporate laptop. AntiVirus was the first, then because I research nasty things more often than most I added a few things on my own like "Anti-Spyware" and "Anti-Spam" and other stuff... then I doubled-up on my Anti-Virus protection and I think I've now got around 5 disparate agents which are all anti-. Guess what folks - odds are that if your company is going to be the target (and I specfically say "target" here for a good reason) of a malware plant - you're still screwed. I specifically mention that if your company is a target because the run-of-the-mill malware that's circulated for days or weeks typically *can* be caught by standard anti-malware agents these days... but targetted attacks such as custom-written malware... you're screwed. The answer? I don't know of a good one, unfortunately. I can tell you that best-practice including locking your users from being local admin still works pretty well. Filtering and limiting people's access from their office computers works pretty well. I'm sure there are many other counter-measures out there too... but education wouldn't hurt. Bottom line is this... stop adding anti- agents to your machines... if the battle is on your doorstep, it's lost already. Would you consider this hypocrisy, irony or some combination of both? LawyersandSettlements.com a news site that publishes cases like class-action law suits against corporations for data breach, negligence, etc... (see link): http://www.lawyersandsettlements.com/search.html?keywords=data+breach is just as guilty as those companies being sued for poor security practice. They've got some basic web site issues that if properly manipulated could lead to the compromise of their users. It would sure be ironic if they ended up on their own pages, wouldn't it? I mean, I'm no lawyer and have zero expertise in this but it would be kind of funny. I wonder how seriously they take security? I also wonder if they grasp that the simple cross-site scripting (XSS) issue demonstrated here could be weaponized to make a whole lot of additional zombie machines (like we need any more of those)! I've sent them a request via their contact us page, I hope to get their reply soon and hopefully they'll fix the issue... and review their web site security some. WOW... Jeff (@SecurityAgent on twitter) took me out to the Devils vs. Senators game tonight - and the Devils sure made it interesting fallig behind 1 to 0 early, then taking 2 goals in a row only to have the Senators tie it with 1:00 minute left on the clock in the 3rd period. Eventually we took it to the shootout - and Marty Brodeur shined as always leading us to a victory, and sealing the Divisional title... again. Devils vs. Penguins in the playoffs - awesome! Any predictions before the playoffs start that anyone wants to make? First let me say that it's been a blast so far getting in front of these two new OWASP chapters! Sherif and Benoit are doing a marvelous job getting people excited and engaged... and I wish you best of luck - hopefully our pathes will cross again in the near future. The Ottawa group was awesome, met a lot of great people and had a fun time - I hope you all enjoyed the talk and topic, and feel free to contact me either through Sherif or directly if you have any follow-up question! You know you're hanging out with a unique group of people when it's 10:30pm and suddenly you're talking about thermite... yea, thermite. (I told you I'd blog about it!) Guys, Moxie's was amazing... quite the place to be definitely. My night here in Montreal was overwhelming. 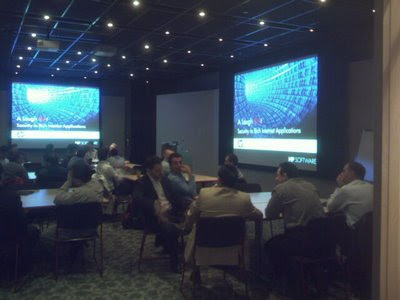 I couldn't have asked for a better turn-out, a nicer facility (special thanks to the folks at CN for hosting!) and a more engaging conversation afterwards. Here are some pictures from the room we had - it was truly a humbling experience! 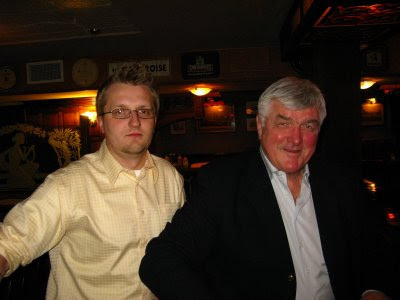 Pat Quinn at some random Irish bar... nice! There's nothing worse than being victimized. Scratch that... the only thing worse than being victimized is then being blamed for the troubles. Now, I'm the first to say that a massive Domain Name behemoth like Register.com should be well-prepared to hold up against even a large-scale DDoS so I think it's only fair to ask those folks to be forthright and honest with the customers about what happened, how it happened, and what they are doing to build more resiliency into their infrastructure. I realize that there are some proprietary company secrets in there they would rather not disclose publicly but in the name of transparency and positive PR they should make a best-effort and really push for openness. My personal feelings here, as a customer of theirs affected by this outage, is that something should have been done to make sure I was at least getting minimal service during this massive outage. While you can't control things like a DDoS we know after years of research that there are technologies that can aide in holding back the flood-waters of a DDoS and at least let some transactions function. As this article clearly points out there are at least two different ways that such an outage can be handled in the PR arena... both of them were terrible. Denial is not good because customers and analysts can see right through it - quite obviously; and radio silence (a la no information) is just as bad... I've been urging the Register.com folks (Nick Dellis posted a comment previously on this blog) to come clean and give us at least some information on what took place. I'm not asking for every intimate detail, I just want to know what/how/why and why it won't happen again... as a paying customer I feel that is my right. There are a lot of DNS services out there, and quite honestly I don't think silence is an acceptable response. If Register.com doesn't feel the need to share some of this information... I don't feel I want to continue as a customer - it's only fair. I'm fairly sure I won't be alone in that regard. Quine (Zach Lanier) with "A Laugh RIAt - Security in Rich Internet Applications"
Thanks to everyone who submitted a suggestion, and to the almost 100 people who voted! You guys rock... Zach eeked a narrow win over Lisa by 2 votes 36 to 34... wow!! The hot story the last 24 hours has been behemoth DNS registrar Register.com. They have been, apparently, getting pounded by a distributed denial of service over the past several (24+) hours, and I can count myself among the domains down. The Inquirer (INQ) is carrying the story here, with little other coverage, oddly enough. What is going on at Register.com? I'm losing business as seconds turn to minutes turn to hours turn to days now... I'm raging mad and I can't even get their overwhelmed tech-support folks to pick up the phone! If you've been affected by the massive DDoS - leave a comment either here or on the INQ's site... Regiser.com needs to know this is not acceptable. One of the most difficult things to do for a technologist is to take a tour of duty on the other side of the table. For someone who deals every day with the technology and realities of security it's difficult to understand why anyone in their right mind would want to do things the wrong way. And yet, every day we're presented with oft-bizarre problems that defy logic and sometimes even common sense - coming from whom we would otherwise thing of as reasonable people. Our associates in the business world can sure as the sun rises ask for some ridiculous things some times, right? What makes them tick and why do they think the way they do? There is a bit of magic that happens when one understands the mind of a business analyst because we can then communicate using the same language and on the same level. Whilel this sounds great in theory let me first point out why it's so difficult for technologists to comprehend the vernacular of business and the logic. From the outset technologists are taught to see the problem as a technology-centric problem. When packets don't cross the wire, the wire must be broken... or something on that wire is dropping the packets on the floor. If we've just patched a server and upon reboot it goes nuclear then the obvious thought that comes to mind is the patch must somehow cause the defect. So the most logical thing to do is to cross over. Go shed your technical propeller-hat and become a business analyst for a few months... but this is a lot more difficult than it may seem at first. Standing in the midst of people who don't think like you do, who don't immediately throw technology at a problem - that may be more difficult tha you're prepared to handle. Remember... technology is simply an enabler for the business. Often times the correct answer for the business is absolutely the wrong answer for technology and security - but it's got to be done. Crossing over, and understanding the other side is paramount in a successful technical security agent's career. Understanding the mindsets, the drives, and the goals of the business side of things will make you better prepared to have a conversation about security.